Nope. I definitely didn’t get carried away while wearing this at all. 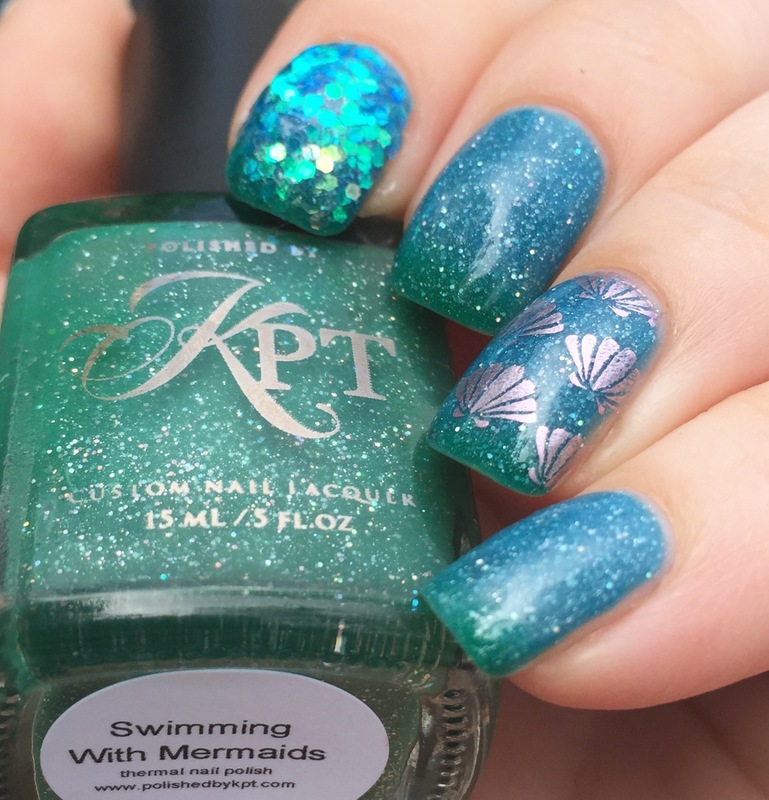 This is “Swimming with Mermaids,” a blue-green thermal with holographic glitter that is part of Polished by KPT’s third anniversary trio. 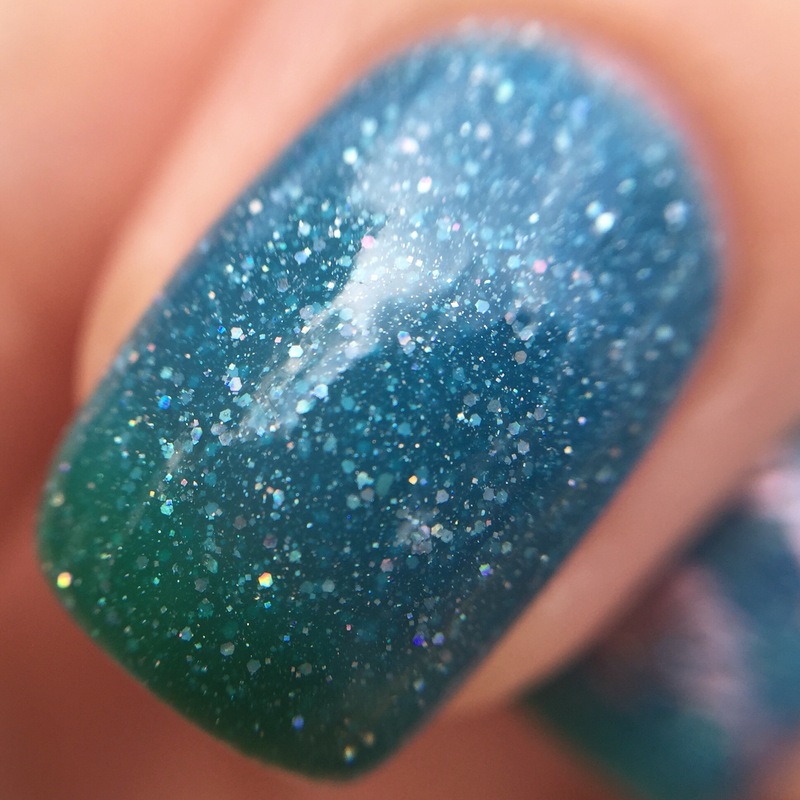 The formula on this leans more jelly, which gives it a great squishy look (see the macros). This is three thin coats, which I found pretty easy to work with. In case you’re curious, blue is the “warm” color and green is the “cool” color. Because it is hotter than the fires of Hades outside right now, I took these pictures with the magic of an ice pack hidden in my purse and kept shoving my hand in my chilly purse to get the transition. My neighbors surely think I’m a lunatic. I loved how this looked all by itself, but holding true to my promises on nail art, I added some stamping and some glitter. I used Bundle Monster’s BM-XL25 plate with A Julep metallic pink for the stamping. Unfortunately, I had trouble with this plate- mine was not very deeply etched and I was having a hard time picking up any images. 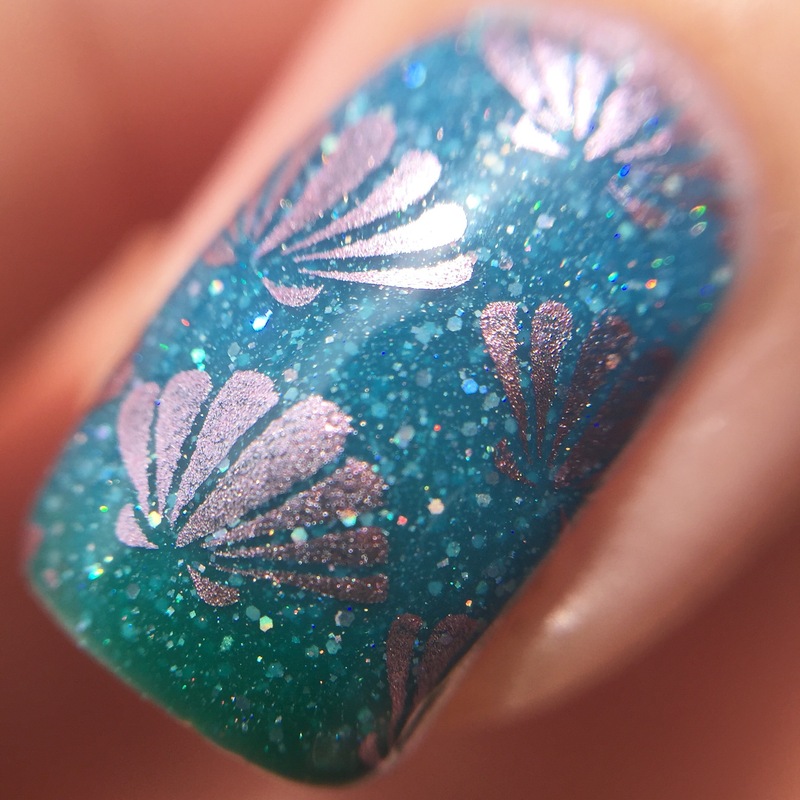 Eventually I found the right combo of image, polish, and scraping pressure, and managed to create this seashell-bra design. I also added some iridescent blue glitter as an accent on my pointer finger. I got the glitter as part of a random pack from Vibrant Vinyls and I’ve been trying to figure out how to use them. I think it looks a little like mermaid scales, right? Plus, I was pleased that I managed two accent nails this time (baby steps)! I picked up “Swimming with Mermaids” and the rest of the trio during the pre-order in June, but you can still pick them up on her website. They’re available both as a set and separately, which is nice. I love thermals and Polished by KPT consistently delivers really great, unique color combinations with strong shifts. What do you think? Where do you stand on mermaids? On thermals? Is it hot enough to melt the One Ring in your hometown? I love all of this. The polish is beautiful! Kermit arms are also kind of a regular phenomena in my house, too. Polished by KPT makes some great thermals. 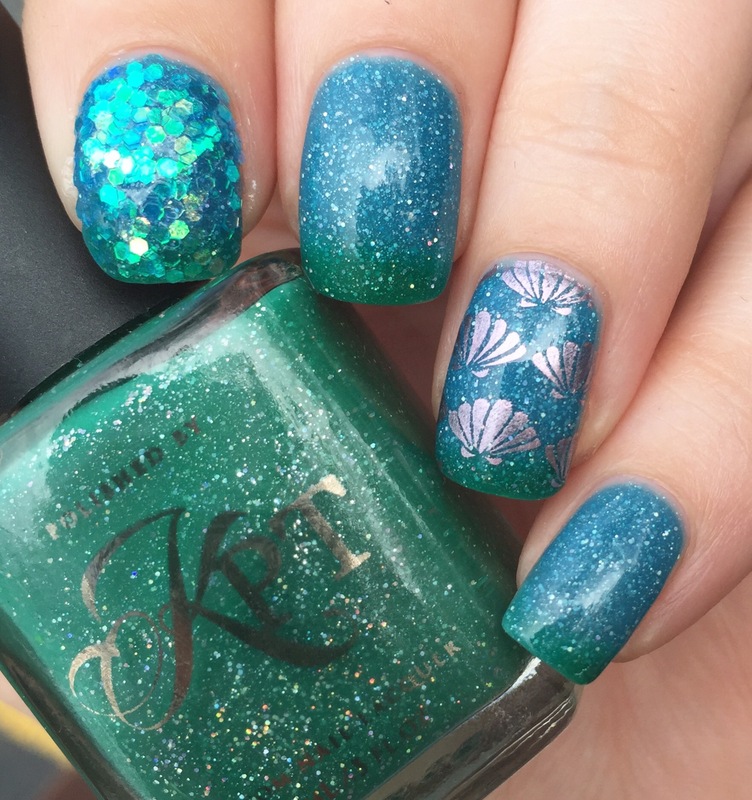 I am totally in love with the whole mermaid feel for this mani. So gorgeous. I’ve got a couple untried KPT thermals in my stash. I think they were part of the basics collection. I might be wrong on that though. I love this polish in it’s green form! I’m not big on thermals, but it really is pretty. Beautiful manicure! Beautiful!! KPT has some amazing thermals!